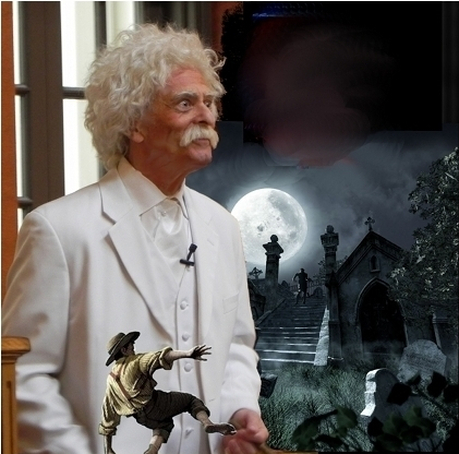 The master storyteller performing the graveyard scene from "Adventures of Tom Sawyer"
Alan Kitty is Mark Twain --telling stories just as Twain did with his family. Storytelling can open the door to creativity for children at a young age. Samuel Clemens owed his career to a slave who told stories to all the children who visited a relative's farm. Alan Kitty keeps that oral tradition alive with Twain stories or adds new ones invented on the spot. Some of Twain's stories came from African-American and Native American tales based on ancient myths. Others are a product of the childrens' own creativity. Kitty invites the audience to select things from around the room and invents a story that includes them all. The children are amazed when Twain succeeds in meeting their most creative challenge with a complete story that often contains a moral tale. And they are thrilled when they can stump him.